In a peculiar instance of art imitating life, I happened to read J. G. Ballard’s 1960 short story ‘Chronopolis’ during a recent stay in Detroit. In Ballard’s tale, set in a future city (the Chronopolis of the title), the population have completely abandoned the notion of sequential time, resulting in a city that is ‘effectively an enormous ring, five miles in width, encircling a vast dead centre forty or fifty miles in diameter.’ Hiding his own interest in the now forbidden timepieces of his ancestors, the central character Conrad sets off on a journey into this abandoned city, meeting the renegade Marshall, and restarting the city’s clocks once again. Typical of Ballard’s writing, this seemingly fantastical story was eerily prescient of the fate of the city in which I read it. Detroit’s decline is always narrated with shocking statistics and chronological landmarks: the riots/rebellion of 1967 which precipitated the flight of Detroit’s white residents to the burgeoning suburbs; the even-more catastrophic exodus (250,000 residents) in the wake of the collapse of the housing market in 2008; and the city’s declaration of bankruptcy in 2013. Recent commentary on Detroit has tended to emphasise two seemingly opposing temporal conceptions: the city as a place of vacant land and ruins that have succumbed to the slow rhythms of nature; or the city as still waiting, in the words of its motto, to rise from the ashes. Both of these conceptions result from an understandable desire to apprehend the meaning of Detroit. As a city with less than 40% of its former inhabitants and with nearly one third of its vast area (138 square miles) now vacant land, Detroit seems to confound everything we expect of a city. 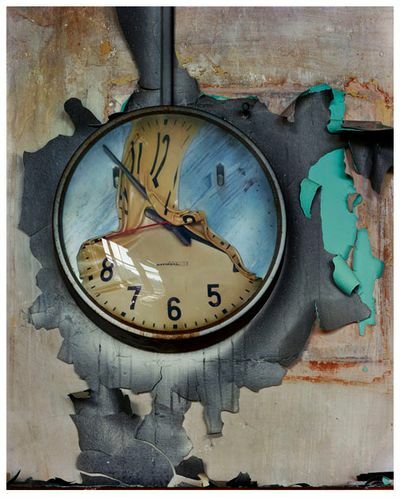 As the photographer Andrew Moore put it in his 2010 book Detroit Disassembled, there’s a sense in Detroit that ‘the past is receding so quickly that time itself seems to be distorted’ – perhaps nowhere better pictured than in Moore’s own image of a half-melted clock in the former Cass Technical High School (now demolished). Like other photographers of Detroit’s ruins, Moore isn’t convinced that the city will rise again; rather, it is nature that is Detroit’s true engineer: ‘Janus-faced’, it ‘renews as it ravages this shadowed metropolis’. The Heidelberg Project on Detroit’s east side. At the same time, people (mainly young white professionals and creative types) are moving back into the city’s core: the billionaire Dan Gilbert has bought up dozens of formerly vacant buildings downtown; while the surrounding areas of Midtown, Corktown and Eastern Market are seeing new apartments being built and boutique shops opened. Here, the talk is of renovation and renewal, of productive forward-looking time regained after the blank wasted time of abandonment. Can both of these time zones exist in the same city? Indeed, they can and do – and more besides. 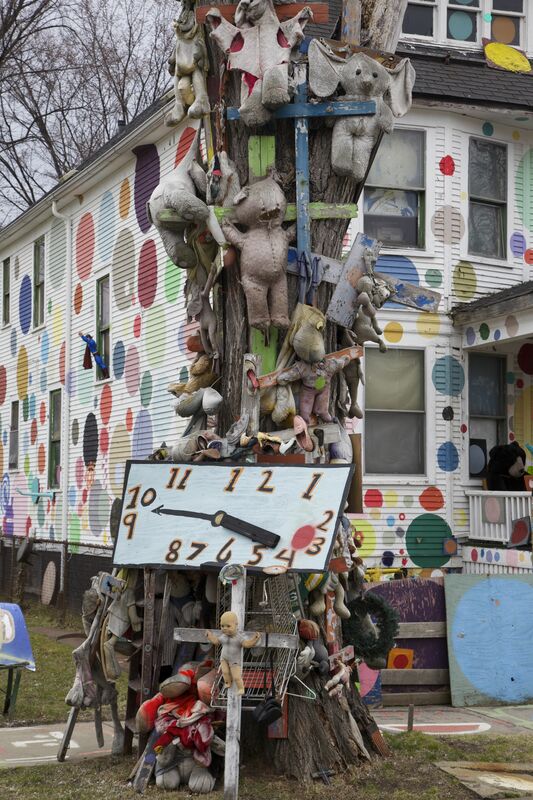 At Tyree Guyton’s world-famous Heidelberg Project on Detroit’s east side, a hand-painted clock (fixed on just after 3.45) is fastened to a pole overflowing with decrepit soft toys and wooden crosses: a time that pinpoints, abet allusively, a past tragedy (all over the city, poles covered in toys signify and memorialise sites of murders). 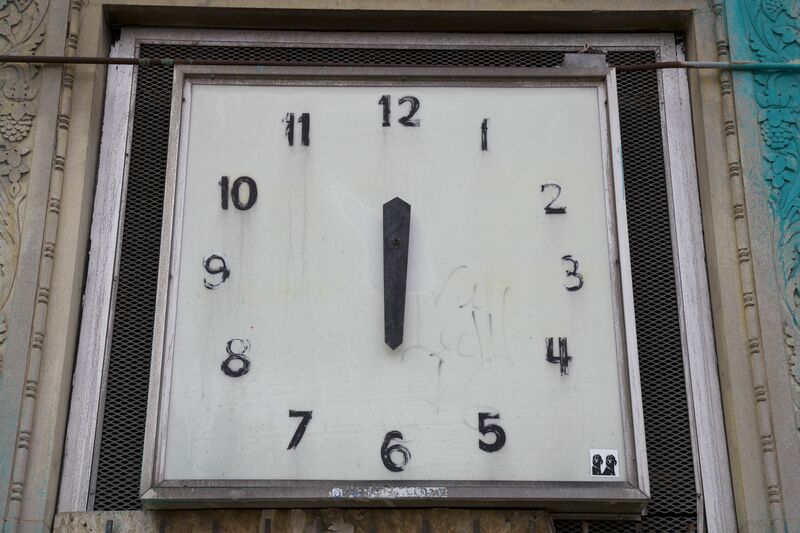 Meanwhile, in Corktown on the near west side, the one remaining hand on the clock over the entrance of the abandoned CPA building points forever at the number 6. 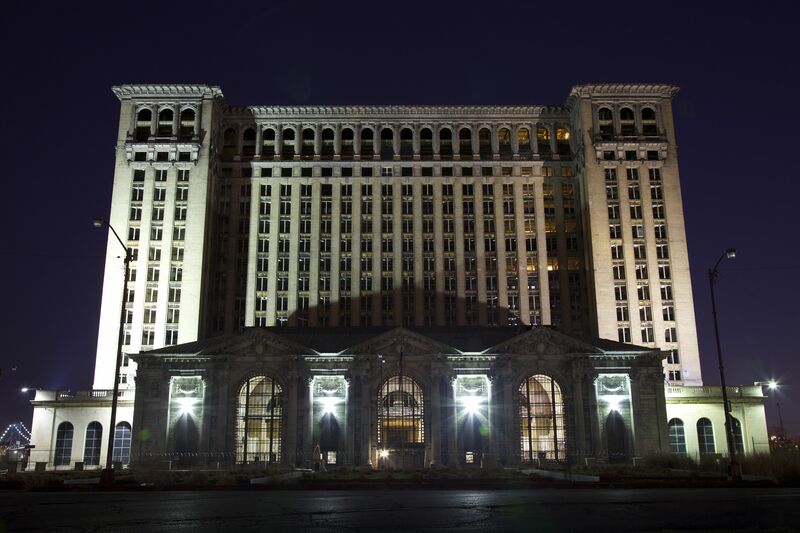 Looming just across the road, Detroit’s most iconic ruin – Michigan Central Station – used to contain within it a clock that stopped forever in the mid-1960s at one minute to seven, signalling the beginning of the end for this architectural behemoth. In Detroit of all places – once the epicentre of clock-based time in the Fordist mass production of cars – these frozen clocks seem to mock any attempt to temporalize the city. What is the past, present or future if time has forever stopped? The answer Ballard gives us in ‘Chronopolis’ is typically ambiguous: if we abandon time, we can never get it back as it once was. This seems to be what makes Detroit such a troubling (yet exhilarating) city: its future is now radically unknown. Hi, I don’t know if you are interested but the Grand Fountain, Paisley, which was the subject of one of your posts, was the winner of the Museum and Heritage Award for a Restoration Project last week. Thanks Damian. That’s great to know – it was a superb job done on the fountain. 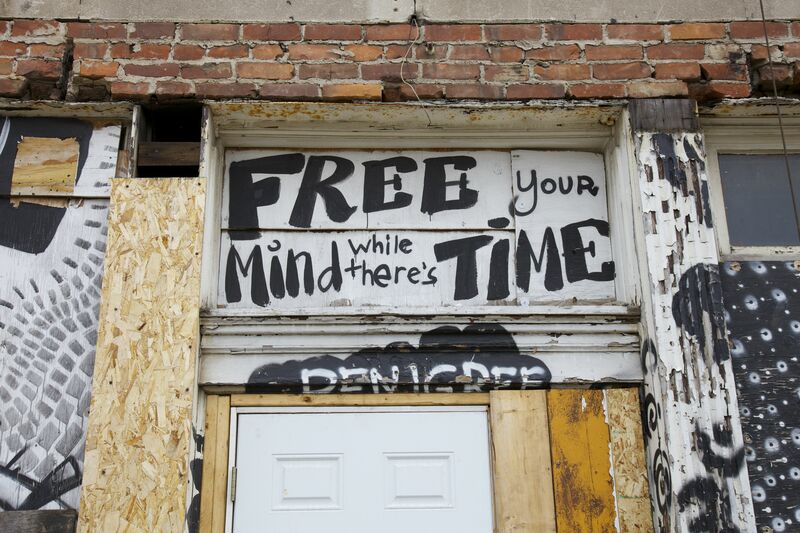 Great post that manages to avoid the clichés about Detroit and come-up with something new. It must have been a fascinating visit. I’m going to dig out that Ballard story and read it again because that’s an excellent one to link to Detroit. Thanks Alex. I’m glad you found something fresh in my approach – now to write the whole trip up! Reblogged this on AGR USA. Thank-you Jacqueline! I really wanted to spend more time at the Heidelberg when I visited Detroit, but only managed to get there once. Great piece. I’m from the Detroit area originally and it’s nice to see something not inherently negative about my hometown. Detroit has charm and character and hope. Thanks Mary. Yes, I found Detroit the most friendly city I’ve visited in the US – totally at odds with its negative image in the press. The people there were just amazing in so many different ways. I am new to your blog and I never read that book, so thanks for the recommendation and connections to present day. Great photos. Well written post! And the photos are beautifully taken. I’ve never been to Detroit but have become totally fascinated by everything I’ve been reading for a number of years now. Great post: your text and photos perfectly capture the other-dimension/other-time feel of an evolution that is so linked to our rapidly changing civilisation. Like a science-fiction tale, we don’t know where it’s heading. Thanks for your response! You should definitely try and make a trip there if you can. The recent fortunes of Detroit always intrigue me. We are conditioned to imagine modern urbanity as an endless path of expansion – a phenomenon that began in earnest with industrialisation 200-odd years or more ago, across the Western world. To see it reversed begs questions. Is it a change of the centre of gravity of that industry, or a change in its nature? I was a social worker in Detroit years ago. Once, when I was driving two little boys from juvenile court back to their foster home on of them looked out the window at the ruins and said, “God doesn’t like us.” His was a heartbreaking little perspective. Thanks Julie. I saw that article just the other day – none of those murals were there when I visited the city in April this year! Come back for the crisp, cool autumn sunshine. And the changing colors. It’s gonna’ be beautiful. I would dearly love to! It was pretty cold and grey in early April. I miss The D!! 😦 great post!! I love Detroit. So many hidden gems. It will rise from the ashes. Beautifully captured. Thank you for sharing. Great post about my hometown. Every time I head back there, a wave of sadness, excitement, wonder and curiosity comes over me. There is no place else like it on earth, that is for sure. Free your mind while there is time. Nice, ideal for a quote. Well written. Great post, makes you want to go and see below the surface for yourself. Lonely Planet for Literati! We must check out Detroit. Thanks! Yes, go check it out – stay at Hostel Detroit or the B&B in Corktown. I fell in love with Detroit a few years back, and have gravitated towards it ever since. Every chance I get, I go to Detroit and explore the rich history etched in the ruins across the city. This article is beautiful. Thank you for sharing! Thanks so much. I’m trying to convince my family to return with me! It is hard for some to appreciate Detroit. To some, it is nothing more than a lost city of ruins and wreckage. I have read comments of people calling Detroit residents savages. It is disheartening because I see beauty in everything. I do not see a city of ruins; I see rich history and culture. I do not see savages. I see survivors with a story to tell. In England, we have some similar issues with cities in the north of the country. It’s really interesting to compare Detroit with, say, Manchester – two single industry-cities where the industry left. Whilst Manchester had a long period of decline, it’s current state is so different from Detroit – not what I was expecting when I visited the city this year. I grew up in Manchester. The city has improved a lot, but am glad to live in London. Enjoyed this. My ex is from Detroit and still loves his city. He discussed the entire story. I think it is possible to rebuild, but it will take effort. Thanks for this. You’re right – there’s always hope while people continue to live in the city. Detroit will rise from the ashes! I love this city and fin it heartbreaking to see what happened to it over the years, but there are so many great and positive people in Detroit who won’t give up on their City! Great Snapshots! Reblogged this on The Clothesline. I used to believe that Detroit was beyond help, beyond hope. What I have seen in the past few years, however has been nothing short of miraculous. The city itself may have its financial issues, but the business people and young “adventurers” who are reclaiming the city are making a difference, and all for the good. It will take time, but hope is alive again in the Motor City. I’m originally from Detroit, now living in Florida (but trying to get home some how, some day). The comparison of the “time zones” is very accurate. The city itself is so warm and inviting, but cold and dangerous simultaneously. Thanks for the read! Whoa, all I can really say. Detroit’s story isn’t unique – many former manufacturing hubs went into decline after globalization kicked in and jobs moved elsewhere. Thanks Harry. Yes, you’re quite right. In some ways it’s unhelpful to focus exclusively on Detroit when so many other cities are suffering in similar ways. But the scale of the ruin in Detroit does make it exceptional I think. Reblogged this on Lucretia T. Knight.